Ukraine sets visa free regime for citizens of the European Union countries, Swiss Confederation, the United States of America, Canada, Japan, Liechtenstein, the Republic of Iceland, the Kingdom of Norway and some others. Near the Kiev city there is located an international airport called Boryspil'. The schedules can be found at the airport site. Note that The WPCF 2010 is planned to occur just before the International Symposium on Multiparticle Dynamics (ISMD-2010) in Antwerp, Belgium. There is direct flight Kiev-Brussel. It takes 3 hours to reach Belgium. The workshop will take place at Bogolyubov Institute for Theoretical Physics NAS of Ukraine. Address of the Institute: 14-b, Metrolohichna str. Kiev, Ukraine. You can find the location of the Institute at this link. You can reach Kiev city from Borispil airport by bus "Polit", bus schedule can be found here. The optimal way to reach hotels and conference site is following : leave the bus at metro station "Kharkivs'ka". 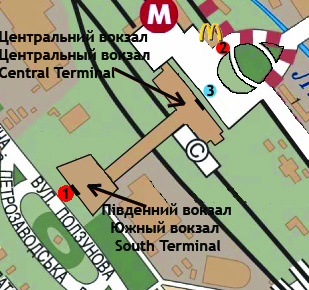 Then, take a metro to the station "Palac Sportu", change metro line (at each intersection station there are only 2 metro lines crossing; the corresponding metro station is "Ploshcha L'va Tovstogo") and go to metro station "Lybids'ka" (end stop). If you arrive to Kiev by train (to Kiev-Pass train station), we also recommend to take a metro to the station "Kreshatyk", change metro line (to station "Maidan Nezalezhnosti") and go to station "Lybids'ka". There is a single exit from the metro station "Lybidska". First take escalator up stairs. Once went through the trigger machine, please proceed forward through the glass doors and then take to the right till the very end of a tunnel. At the end of the tunnel please take to the left, go up stairs and in about 10 meters ahead there is a desired bus stop (see the map above). Just take the bus ## 80, 11, 12 (to the hotel "Holosiyivs'kiy", address : boulevard of 40-letiya October, 93) or bus ## 38k, 38, 172, 548 (former 63) or 84 (to the hostel of ICE, address : Vasyl'kivska str., 36, bus stop "Amurskaya square") and ask the driver to stop at your destination point. However, you can also get to hostel of ICE by bus #458 directly from the North terminal of Kiev-Pass train station. The bus #458 has not bus stop allocated here, so it usually stops next to McDonalds (point (2) on a map), which is seen to the left when you exit North terminal via the main entrance(point 3). Please ask driver if the bus goes in the direction to Vasil'kovskaya street and ask driver to stop at the bus stop "Amurskaya square", which is in ~35 minutes from the Kiev-Pass. From the hostel of ICE to BITP by bus : Just go outside of your hostel to the Vasyl'kivs'ka str. (see map below, point A) Wave your hand, when you see the bus # 548 (former 63) coming. Then go to the end stop (near point B, which is BITP entrance). 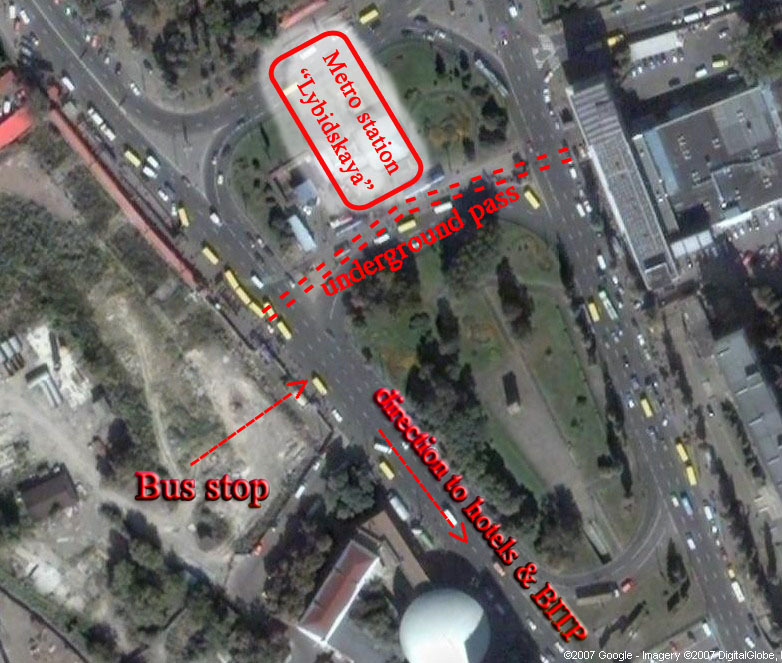 From hotel "Holosiyivs'kiy" to BITP by bus: Leave your hotel from the main entrance (point A, see map below) and go to the left along the wide road which is the "Prospect of the 40 Years Anniversary of October Revolution". Walk for about 10 minutes (to South) till the junction point with another big street "Vasyl'kivs'ka". You should cross the Prospect via the underground tunnel and then cross the "Vasyl'kivs'ka" street at the traffic light which is just nearby (point B). 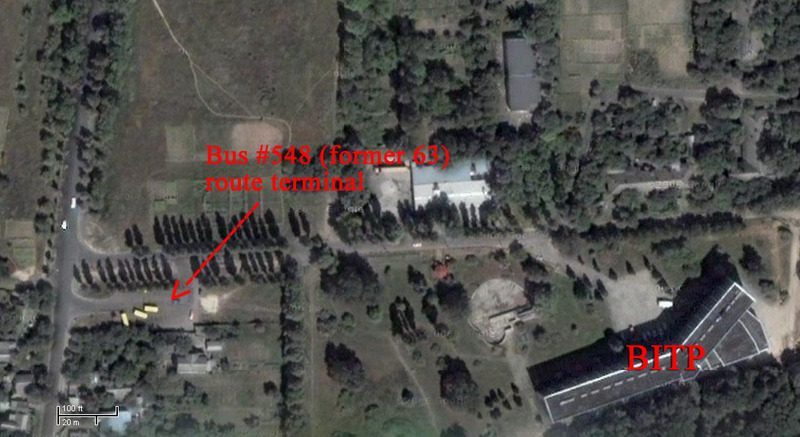 Then wave your hand, when you see the bus #548 coming, and go to the end stop (near point C, which is BITP entrance). Leave the bus at the end stop (near Khotiv village). The distance from the end stop to BITP is approximately 200m. From the hotel "Mir" to BITP by bus : Just go outside of your hostel to the 40-richchnya Zhovtnya ave./"Prospect of the 40 Years Anniversary of October Revolution" (see map below, point A) Wave your hand, when you see the bus # 548 (former 63) coming. Then go to the end stop (near point B, which is BITP entrance). From hotel "Holosiyivs'kiy" to BITP by the cab(taxi) : In the evening at the reception desk of your hotel please ask for the taxi reservation to go to BITP in the morning. The taxi fee is reasonable, and, if you share it with three other participants of the Workshop, it will cost a little.